Harvey Doischen (right), ADI branch manager in Pompano Beach, FL welcomes Steve Yarley, owner of Skylink Electronics, as the 200th dealer to ADI's SNAP-IT Program. 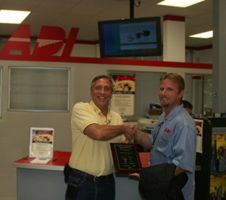 MELVILLE, NY -- ADI has signed Skylink Electronic as the 200th dealer to its SNAP-IT Program. With the help of ADI's SNAP-IT Program, Skylink Electronic plans to move into the light commercial market and generate new sales opportunities. Open to all ADI customers, the SNAP-IT Program provides dealers with the resources to become all-in-one solution providers and win sales opportunities in healthcare, retail, legal, hospitality, and general small businesses. Program benefits include superior products, direct vendor access, cutting-edge marketing materials, support, dedicated training, and the convenience of shopping at over 200 ADI branch locations. In conjunction with ten ADI vendors, the SNAP-IT Program was developed in 2005 to help dealers enter the light commercial market to sell integrated solutions and increase revenue. Participating vendors include Crown, Dedicated Micros, HAI, HES, HID, Honeywell Genesis Series Cable, Leviton, Securitron, Vodavi, and XM Satellite Radio.